A Girl, A Blog & Life In-between!!! 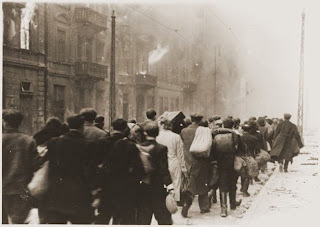 : Warsaw Ghetto, 1943 .... The Jewish Uprising!! A Girl, A Blog & Life In-between!!! I'm an Irish Girl, A Dubliner, with the 'Gift of the Gab' ... I like to talk & to tell you things. In Celtic times news, views and comment were carried from place to place by wandering Seanachaí ~ Storytellers ~ who relied on their host's hospitality and appreciation. I will need that from you too, as I venture to share Politics, Poetry, Laughter, Love, Life & everything in-between ... from Bog to Blog!! Warsaw Ghetto, 1943 .... The Jewish Uprising!! 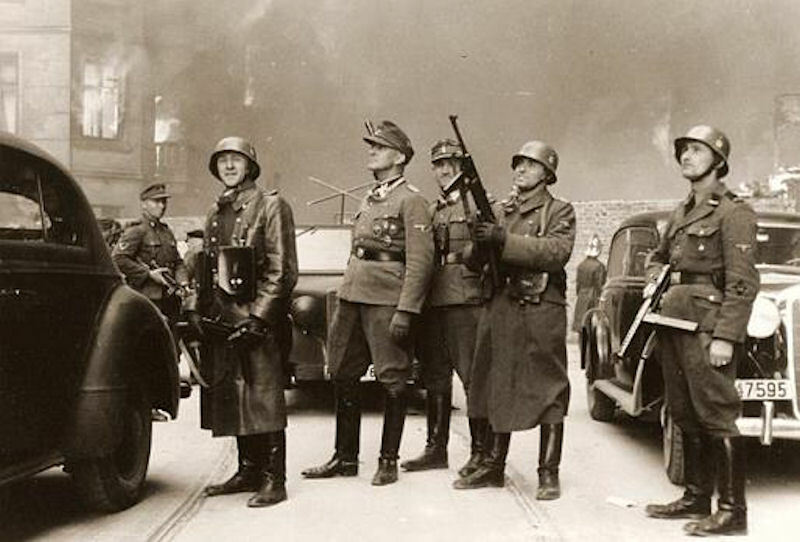 SS Major General Jürgen Stroop watches the Warsaw Ghetto burn. On Thursday, Yom Ha'Shoah, it was also by Hebrew Date the Anniversary of the beginning of the Uprising in what is historically termed the Warsaw Ghetto. This uprising by Jewish fighting units was the first major organized resistance to German occupation throughout Europe. On April 19th, 1943, hundreds of Jewish men, women and children of the Warsaw Ghetto launched an Uprising against heavily armed Nazi Stormtroopers. For twenty-seven days, Jews fought bravely bearing what few weapons and arms they had against the overwhelming Aktion of the German Wehrmacht and specialised SS units. It was the largest Jewish resistance movement of World War Two. But it was more than that. More than the first body blow to the Nazi Genocide Machine's supposed invincibility. It was the first piece of land under Jewish Rule in the third reich. It was a Beacon of the Future in Nazi occupied Europe. An Island of Defiant Rebellious Jewry admist a sea of indifference to Nazi genocide. The Jewish Magen David or Star of David, that became the flag of the State of Israel was raised over this portion of Jewish Europe. It deserves to go down in history as a foundational event of the State of Israel itself & be remembered not only on Yom Ha'Shoah, (Holocaust Remembrance Day) but also on Yom Ha'Zikaron (Israel's Memorial Day ~ next Wednesday) & on Yom Ha'Atzmaut (Israeli Independance Day ~ next Thursday). All of which occur this coming week, B"H.
The Warsaw Ghetto was established on October 2nd, 1940 by Dr. Fischer, Governor and Head of the Warsaw District. All Jews in the surrounding area were ordered to move to residences within the designated areas by the end of the month. For the next year and a half thousands of Jews were deported from nearby cities and towns and herded into the ghetto until eventually there were from 300,000 to 400,000 Jews crowded into an area of only 1.3 square miles. (3.4 square kms). On November 16th,1940, the Germans sealed the Ghetto by building a high wall around it, topped by barbed wire and guarded by armed sentries. Any Jew caught leaving the ghetto compound was shot on sight. Living conditions were deplorable .... typhus was rampant, and food limited to barely 184 calories per day per person. Jews were being starved slowly to death & indeed Over 100,000 Jewish ghetto prisoners died. The first deportations began on July 23rd, 1942 and lasted until September of that year, carried out on the pretext of "relocating" Jews to "work camps", but instead they were being exterminated at the Death camp of Treblinka. From 254,000 to 300,000 Jews were exterminated there. By the end of the year it became apparent to Jews that the so-called deportations were a ruse. By then, the remaining Jews were becoming determined to fight to the death, despite woefully insufficent arms. It seems neither the goyim of the Polish Home Army nor the Allied forces in general thought it a war aim, or even a war priority, to prevent Jewish genocide by supply of arms, food nor assistance of any kind no matter the increasingly desperate circumstances for Jews. In January 1943, Warsaw ghetto fighters fired upon German troops as they tried to round up yet another group of ghetto inhabitants for deportation. Fighters used a small supply of weapons that had been smuggled into the ghetto. After a few days, the germans retreated. This small victory inspired the ghetto fighters to prepare for future resistance. After the January battle, the Jews spent the following weeks training, acquiring weapons, and making plans to defend of the ghetto. The Germans also prepared for the possibility of a fight. On the eve of the final deportation, Heinrich Himmler replaced the chief of the SS and police in the Warsaw district, Obergruppenfuhrer Ferdinand von Sammern-Frankenegg, with SS und Polizeifuhrer (SS and Police Leader) Jurgen Stroop, an officer who had experience fighting partisans. On the morning of April 19th, 1943, the Warsaw Ghetto Uprising began after German troops and police entered the ghetto to liquidate its surviving 35,000 inhabitants. Seven hundred and fifty fighters armed with a handful of pistols, 17 rifles, and Molotov cocktails faced more than 2,000 heavily armed and well-trained German troops supported by tanks and flamethrowers. The Germans were apparently 'surprised' by fierce resistance from Jewish Fighters & the next day brought in tanks and armoured cars in an effort to quash the revolt but the Ghetto Jews valiantly continued the fight back. The entire Jewish population went into hiding in the ghetto itself. For the days and weeks which followed there were gunshots, explosions and grenades. 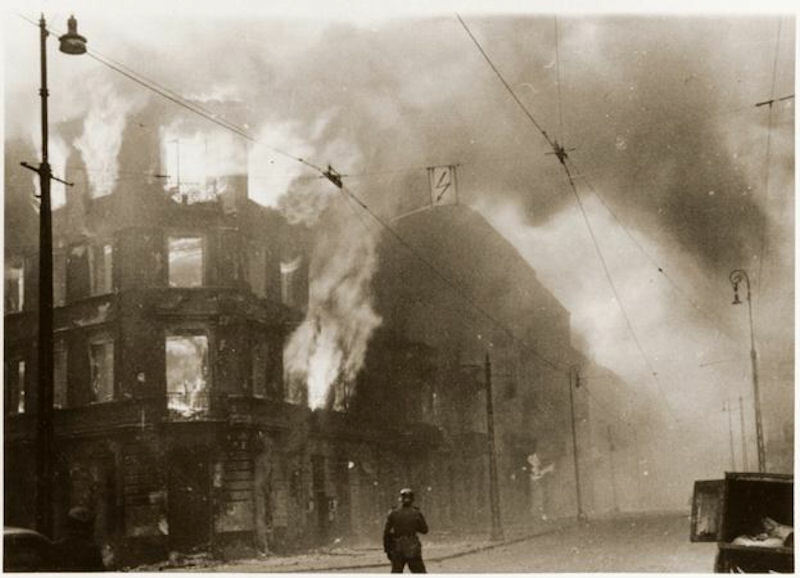 By the 28th of April the Germans began to set fires to the houses in the Ghetto, systematically, one by one, block by block until the entire Warsaw Ghetto was engulfed in flames. The Jewish fighters suffered heavy casualties, but continued to fight heroically, weapons in hand. They managed to kill over 300 Germans and wounded 1,000 more. What a magnificent achievement, unequalled in WWII and a firm testament to Jewish tenacity, Baruch Ha'Shem!!!! 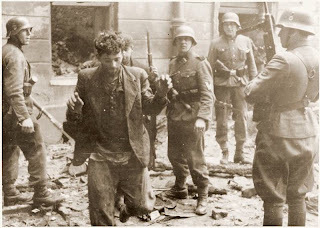 Seven thousand Jews were killed in the Uprising, HY"D. Those who were killed in action had done their duty to the end, to the last drop of blood that soaked into the pavements of the Warsaw ghetto. We, who have not perished, have a duty of Zakhor, of Remembrance, a duty to keep the memory of those Jews & their Resistance alive ~ Forever!!!!! The video below relates to the movie "Uprising" based on Leon Uris's Novel, "Mila 18". I'm Irish & Jewish & passionately Zionist. Travelling & trying new things excites me. I Read. Torah, Fantasy Fiction, Mythology & History & I Appreciate Art in all it's forms ~ Pre Raphaelite is my favourite. I Adore All things Gothic, Movies, Medieval & Victorian Poetry, Photography. Surrounded by Sounds I Cook, Bake, Knit, Sew, Pretend to complete my Phd & Crave Chocolate!!! I've always been a Dreamer. My first fantasy encounter was 'The Wizard of Oz 'movie when I was a tiny (tinier) girl ... when Dorothy walked out of that Tornado Tossed house and into multi-coloured Munchkin land, it left a lasting impression. I'm a fan of Medieval History, Literature & Mythology, with its vast underpinnings of the past, of tales left over from the beginning of the world, luminous heroes and sages, prophecies, wonders, destinies and dooms and that magical realm across the sea where dying heroes go to dwell. This treasure of image, myth, magic, & language, an older age when such wonders as Magic Rings and Dragons existed is my Universe. Faery is my Forte ~ Dark & Delicate my Delight! Yom Ha'Shoah ..... Cherish Our Children !!! Triumph to Tragedy .... Titanic's Jews!! Primo Levi ..... Author & Auschwitz Survivor!! It's Pesach .... Free Pollard Now !!!!!! Vehi Sheamda ~ Torah is Triumph!! The ads on this site are from google and may not necessarily match the views of Princess Pana or David Dome!! ~ Copyright ~ Princess Pana !!! .......... Awesome Inc. theme. Powered by Blogger.